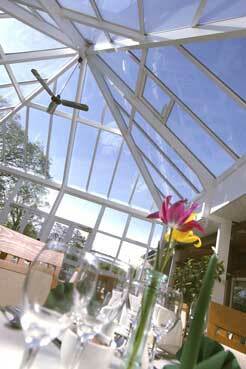 Conservaglass, launched in 2002 by Ultraframe, was the first high performance glazing product designed specifically for the requirements of conservatories in the UK climate. Ultraframe has recently launched some new variants of sealed units to sit alongside the highly successful Conservaglass range, providing Ultraframe users with a broad spectrum of glass options to offer to their customers. Now one call gets it all. Ordering a roof and glass from one source, ensures there are no mis-measures or time wasted waiting for glass sizes or trying to work out sizes on difficult shapes. All Conservaglass is UK manufactured by Pilkington, meaning that lead times are just 5-7 days, and for total convenience can be delivered to Ultraframe customer’s premises, or direct to site on small vans that can easily navigate domestic housing estates. All units are toughened; gas filled and come with a silver spacer as standard, however, to offer total choice to end users bronze, gold & white are also available. The newly launched Anti-Sun and Clear sealed units are available in a choice of blue, grey or standard clear sealed units with the added options of soft coat low ‘e’ (1.2) or K glass (1.5) on the inner leaf, meaning that installation companies can now offer a variety of glazing performance characteristics at value price points - in addition to the existing Conservaglass range. We'll put you in touch with your nearest Which? Approved UltraInstaller, who has been tested and assessed for their competency. Window Exchange professionally install a Livinroof in Cheshire. The results are in from an online poll by conservatory and extension specialist, Ultraframe, about whether homeowners prefer a traditional or modern orangery – with a resounding 74% choosing the modern style. Got your heart set on your next home improvement? Get in touch and we'll offer you a bespoke price. Take a moment to relax and browse through our brochure, it's an easy way to see our full product range.